Supremely well-situated in the heart of Seminyak and just 200 metres from the vast expanse of Seminyak's sunset beach. Le Jardin Villas are within a 5 minute walk to some of Bali's best restaurants and nightlife, a 20 minute drive from the International Airport and only a 30 minute drive to Bali's world class golf course at Nusa Dua. 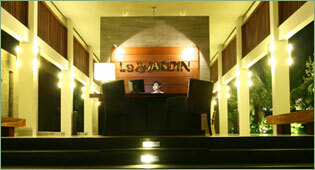 The highly desirable combination of privacy and luxury beach living was what inspired Le Jardin's inception. Developed on 4000m2 of land, with exotic landscaping that includes seasoned rain-forest trees, Le Jardin is an unsurpassed location in which to enjoy a tropical retreat.